This will be a game of DominGo on a 13x13 board. 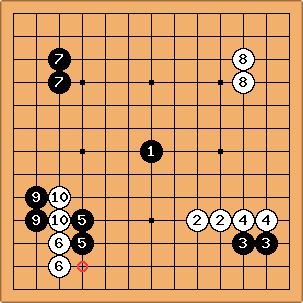 Please use the usual OngoingGame conventions of numbering your moves and starting a new board every ten moves. I hope for some interesting Kibitz here. 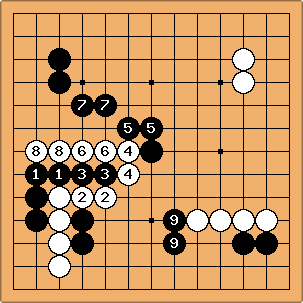 To make a move, just add two orthogonally adjacent stones, and number both (with the same, appropriate move number of course). Refer to DominGo for any questions about rules or DominGo life and death. Alex Weldon: - ...except, seems a bit like the domingo equivalent of squeezing out the toothpaste. PurpleHaze: - taking the corner. bloudek: - slicing into the side..
KarlKnechtel: - Two corners each. ChessWhiz: - Taking the top-left corner. Let's keep the game going!! ChessWhiz: - Taking another corner for black. - To reduce black's advantage in going first, he is only allowed to play one stone on his first move.